Glo Dental is a Corcoran based family dental practice that treats patients of all ages. We are committed to delivering the highest quality dental care and do so using the state-of-the-art dental equipment. We are a cosmetic dentist that offers services like checkups, teeth cleaning, crowns, veneers and more. We also perform emergency dentist services that include bonding, root canals, crowns, and bridges. As a local dentist, we create lifelong relationships with our patients and their families and work to ensure that they receive treatments in a comfortable and relaxed environment. 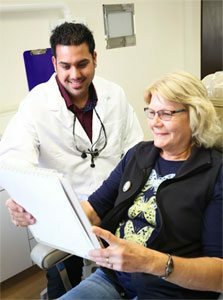 Dr. Panchal and our staff invite you to schedule an appointment by calling 559-762-7587 and experience why our patients think Glo Dental is the best dentist in Corcoran. Dr. Rushi Panchal was born and raised in Los Angeles, CA. 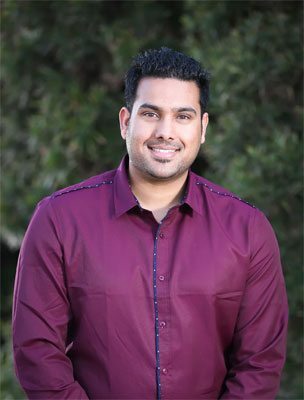 After attending college in LA, he made the decision to have a more hands on approach to health care, and completed his degree in dentistry in Manipal, India where he met his wife Dr. Nandita Panchal who hails from Nairobi, Kenya. Both doctors then graduated with their doctorates from the International Dental Program at De la Salle University in Mexico in 2014. They were blessed with their son, Aaryan, a year ago and have a pet shitzu, Simba. They enjoy traveling and discovering new cuisines together. While Dr Rushi enjoys reading good and interesting books, Dr Nandita prefers to spend her time catching up on movies. Dr Rushi joined the rotary club last year as an opportunity to serve.